This centerpiece from Martha Stewart spices up the traditional table top pumpkins from your local farmers market. 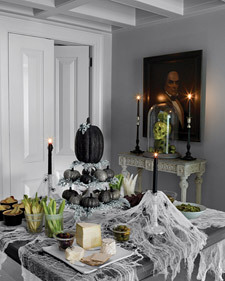 It’s easy to transform any home into a haunted manor; here, a towering glittered pumpkin centerpiece, gothic silver candlesticks, and black candles shrouded in “spiderwebs” do the trick. 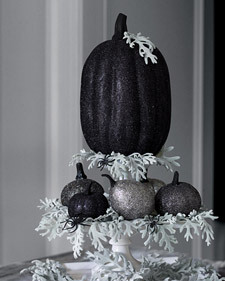 These synthetic pumpkins of varying sizes glisten with a spectral sheen thanks to coats of paint and ultrafine opaque black, silver, and charcoal (a mixture of black and silver) glitter. They are arranged on a tiered cake stand; layers of ‘Dusty Miller’ foliage and a slew of artificial spiders evoke a ghostly garden. To decorate the pumpkins, first paint them black, then apply tacky glue to half of each pumpkin using a paintbrush. Hold pumpkin over a bowl filled with glitter. Spoon glitter over glued surface, making certain the glitter falls into all the crevices and sockets, and any excess lands back in the bowl. Place on a plate or tray and let dry for at least 1 hour. Tap or brush off any excess glitter. Repeat gluing and glittering on uncoated surface of each pumpkin until completely covered, and touch up other areas as needed. For more Martha Stewart Living, shop your Chicagoland Home Depot. I’m a writer, graphic designer, wife and mother of two girls (and our pup), writing about my adventures in it all! Formerly the home of my blog, Poor Girl’s Guide Chicago. You can still find all of my archives here! Stay connected to local deals, events, sales, specials and more!